This is a sponsored post in collaboration with KIDDO TV. All thoughts and opinions are my own. A few weeks ago, I received an email from a person asking me to take a look at their YouTube children's channel. This is a fairly common occurrence for me, so I clicked on the link without any great expectations. After watching one episode, I was a fan and knew it was a great fit for MommyMaestra readers. So I agreed to work with them to share their great content. KIDDO TV is a YouTube channel dedicated to creating and sharing educational and entertaining videos for children. They have a number of shows for kids probably as young as 4 years old up to 12 years old (this is my own estimation based on watching the videos). As a parent, I know how hard it is to use YouTube as a teaching tool with children because there is simply too much inappropriate content shared on the site. That's why I love finding original YouTube channels, such as KIDDO TV, that you can safely pull up and/or subscribe to without fear of commercials and links to videos not intended for children. Back to KIDDO TV - This channel is definitely worth checking out because all of the shows teach young children valuable lessons. Below is a short description of three of the different shows that are featured. My absolute favorite series is ART LESSONS. Each video lasts approximately 15 minutes and is like sitting down in art class for an actual lesson. Miki is our teacher. 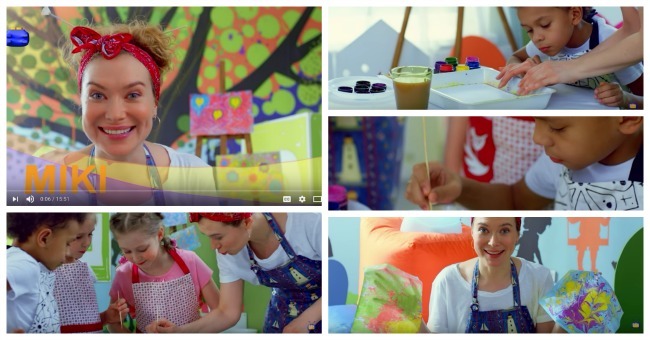 With paint brushes sticking out of her hair and her fun apron, she's exactly what I think of in an art teacher. Miki is fun, thorough, and engaging as she encourages the children to create their own masterpieces using the techniques she carefully shows them. "It's not a mistake, it's just going to make a different picture," she says to one boy when he uses a little too much of one color. I simply love how she teaches children to not just make art, but how to look at it, too! I also think parents will like how organized the lessons are and how she clearly explains each step. I also appreciate the diversity of the students on the show. In fact, the entire channel has a multicultural feel which appeals to me as a parent raising global citizens. This series could EASILY be used as part of your child's homeschool art curriculum. There are currently only 10 lessons/videos, so this would work mainly as an art supplement. As a homeschool parent, I would watch the lesson in advance, so that I would know what materials I'd need to purchase or prepare. And then your kids could simply watch the lesson on their own and complete the project. This animated series is for a much younger audience. The focus here is on introducing children to making healthy, responsible choices. The videos are much shorter - typically only a minute and a half. The idea of the 25 videos in this series is to teach a single concept, such as brushing your teeth, picking up toys, making your bed and so much more! As a parent, I would recommend watching one video a day together with your child and then putting what they learned into practice. I love how the messages help to boost your child's self-esteem and independence. This show is a little more unusual. Again, it is geared for younger children and is about Stroosh, an alien who has awakened on Earth but he doesn't know who or what he is or where he came from. He befriends a young boy named Luca, who introduces him to the planet Earth using his handy "Lucapedia." 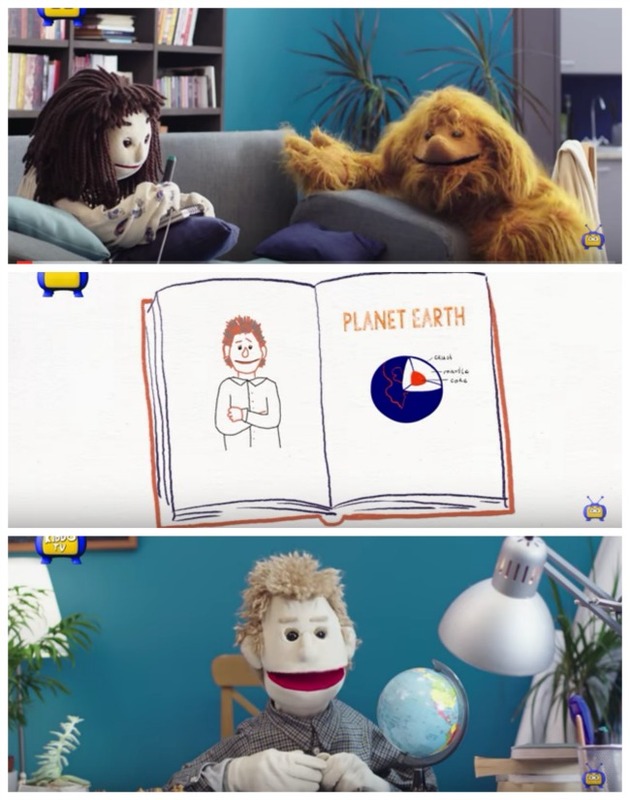 I think this show is pretty engaging for young children because the main characters are all puppets. It is well done, but has very simple dialog for a younger audience. There are several other series that are fun and instructional for children, but you'll have to visit their YouTube channel to learn more about them! I think you'll like how diverse each of the shows are - there's something for everyone! And if you visit their website, you can download and print coloring pages that feature characters from their popular shows.